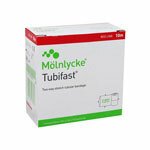 Molnlycke Tubifast Retention Bandage, Purple, 10" X 33 FT sold by roll 2444 is lightweight elasticated tubular bandage with radial and longitudinal stretch. 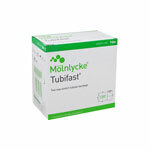 Molnlycke Tubifast Retention Bandage, Purple, 10" X 33 FT sold by roll 2444 is lightweight elasticated tubular bandage with radial and longitudinal stretch. This unique mode of action allows patients complete freedom of movement, with added comfort. Ideal for dressing retention and skin covering for any part of the body. It can also be used for patch wrapping and as an under-cast stockinette. It holds dressings securely in place without the need for tapes, pins or ties. 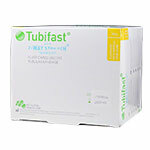 It is quick and easy to use, with less risk of fraying than traditional tubular bandages.